It's summertime and the holidays are here. Unlike many overseas countries where December is a time for snow, in South Africa it brings hot, sunny weather. The best way to cool off on a hot day is to swim or splash in cool water. Many children will be visiting relatives in the rural areas and on farms where one of the most exciting things to do is swimming in rivers and dams. But this can be dangerous, because many children can't swim. Nearly 64 per cent of drownings in South Africa happens in rivers and dams. Drownings are the second highest cause of accidental deaths in the country. More than half of drownings involve children under the age of 15 years. Swimming South Africa is running the programme with the Department of Water Affairs and Forestry. Instructors teach children to swim and have fun in the water, but to be aware of the dangers, be it in dams, rivers or lakes. Swimming South Africa is also raising money to build swimming pools in rural areas. This will be done through municipalities. With this project they want to make sure all children have access to swimming pools. Before diving into the water, check how deep it is. 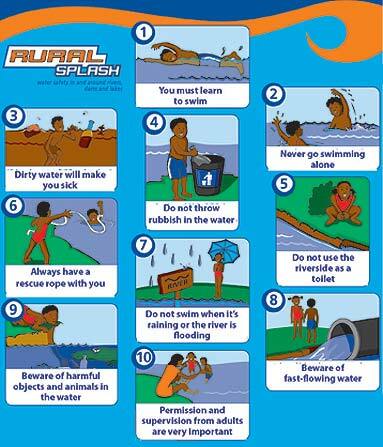 Teach children to swim and also teach them about the dangers of water. If you live near water, make sure you know where small children are at all times. Don't stand on hanging river banks or loose rocks near water. Be sure you know where streams and water pools near your home are.